The satire on Washington politics and political figures, I’d Rather Be Right, opened on Broadway in late 1937 and ran for 290 performances. With a book by Moss Hart and George S. Kaufman and music by composer Richard Rodgers and lyricist Lorenz Hart, it starred George M. Cohan as Franklin D. Roosevelt. Advance ticket sales set a record. Although Rodgers and Hart were pro-FDR, they liked the idea of lampooning political institutions and felt that the project could be done in good taste and with humor. But they were extremely unhappy with the choice of Cohan with whom they’d worked in Hollywood five years earlier. He made no attempt to hide his contempt for the songwriters. Besides, Cohan hated Roosevelt. In fact, on opening night Cohan inserted his own lyrics into an encore, much to the displeasure of the songwriters. But in his autobiography Musical Stages Rodgers admits that although reviews of the show weren’t raves, Cohan received glowing accolades. “I’ll be the first to admit that he fully deserved them,” says Rodgers. In his book Easy to Remember: The Great American Songwriters and Their Songs William Zinsser calls it one of his “two favorite key-changing bridges--gems of unexpectedness--(‘Then all at once I lost my breath’).” His other favorite is Hoagy Carmichael’s “Skylark” (“And in your lonely flight”). In his commentary on John Coltrane’s “Giant Steps” on jazzstandards, reed and horn player Jay Thomas suggests that the bridge with its movement through keys by major thirds might have been an inspiration for Coltrane’s composition. It happened--I felt it happen. I was awake--I wasn’t blind. I didn’t think--I felt it happen. Vocalist Tony Bennett used the song as the title of an album. The Sauter-Finnegan Orchestra recorded the tune as did trumpeter/vocalist Chet Baker and bassist Ray Brown; guitarists Tal Farlow and George Van Eps; pianists George Cables, Ahmad Jamal, and Red Garland; vibist Cal Tjader and violinist Stephane Grappelli. Recent recordings are by pianist/vocalist Eliane Elias, saxophonist Don Braden, guitarist Mark Elf, harmonica player Hendrik Meurkens, and pianists Bill Mays, Roger Kellaway and Bob Florence. Alto saxophonist Lennie Niehaus’ 1954 octet session showcases not only his fine playing but also his exquisite arranging which would lead him into a movie soundtrack career. He’s surrounded by a talented group of Hollywood’s best on this session, and they swing the number in a bouncy manner. The prodigiously talented pianist Art Tatum recorded hundreds of performances for producer Norman Granz’s Verve label in the 1950s. Tatum recorded both solo and with guests; his 1956 Verve session with tenor sax giant Ben Webster finds both men in a soulful groove, Ben’s breathy approach giving this tune just the right touch. Swing era trumpeter Roy Eldridge recorded two strikingly different versions of “Miss Jones” for Verve; the first, with wild man tenor saxophonist Illinois Jacquet in October, 1956; then a restrained version with strings a year later. This energetic, fast-paced performance finds pianist Tyner inventing at a dazzling rate while drummer Roy Haynes and bassist Henry Grimes fire on all cylinders. Tjader’s Latin rendition of the song is as hip as they come. A bongo-based percussion provides the carpet over which the vibraphonist lays down the infectious melody. It is indeed a swinging night at Birdland as the ever-jubilant Williams revels in this live performance. The vocalist is at his most endearing as he scats in friendly rivalry with trumpeter Harry ‘Sweets’ Edison. This rare outing features the marvelous but seldom heard guitarist Billy Bean along with pianist Norris and bassist Hal Gaylor. 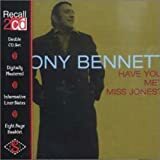 A lovely, swinging reharmonization of “Have You Met Miss Jones” is one of the highlights.